Thanks for checking in on us. Looking at the last post date, it looks like we're quite overdue for a message and some new pics:) These pics are of Halloween and some random shots of B. 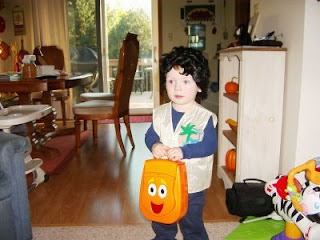 He was Diego for Halloween, but he was mistaken for Elvis and he could've possibly passed for Wayne Newton with that wig. 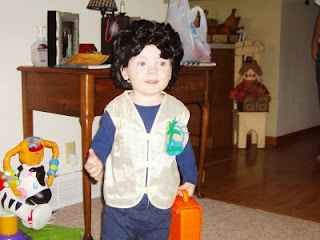 He had so much fun and felt pretty comfortable near the end going up to strangers wishing them "Happy Halloween." 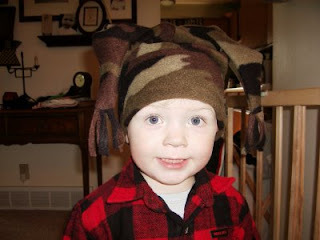 There's a piture of him ready to go out in the garage to help daddy (with another crazy winter hat on). He calls himself "workin' Braden" when he goes to help dad. The one picture of him sitting there with the toy magazine pretty much sums up his latest craze. 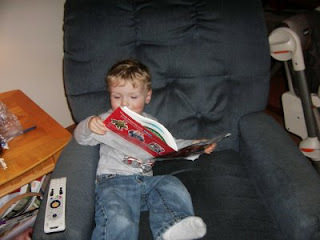 He's addicted to any toy newspaper ad or magazine that comes in the mail. He studies it closely, asks what everything is and even corrects you when you don't say it right:) He's quite the little ham these days. He enjoys singing, especially Johny Cash's Folsom Prison (that should for sure get a nomination for parents of the year award:) He's also getting to be Mr. Independent with, "I do that" or "That's mines". Tonight he corrected me by saying, "Mama, don't say darnit, say oh my gosh." He's quite the character and keeps us on our toes everyday. A couple of our heart buddies just recently had some procedures done at CHW. 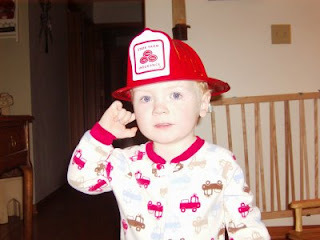 Liam just had his Fontan and was out of the hospital in 6 day....way to go Liam! Super Sam had a heart cath procedure done and recovered quite nicely. We continue to pray for these boys as they continue to heal.